A flying machine with AutoPilot! Advanced sensor artificial intelligence helps it avoid obstacles including your hands. Also has remote control mode so two Bladestars can dogfight. A sleek new robot dedicated to dancing with fluid movements and emotive sounds. Automatically dances to any music playing or can be taught your own custom routines using her joystick hands. 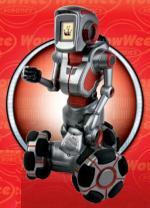 The first WowWee robot that uses an animated face with synchronized facial expressions and sound, via a head mounted full color LCD, to tell jokes and even your fortune with the ability to download new personalities from the Web. 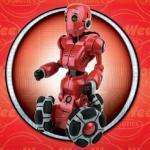 Use your PC to craft custom action sequences for any of your WowWee infrared controlled robots. 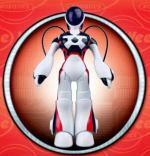 Then take the Roboremote with you and play those sequences anywhere, anytime. The personable young robot that plays interactive navigation games with you and has a tilt sensor driven remote control that lets you move it just by tilting the remote control. Also acts as a tricky alarm clock that will run away from you in the morning when you try to stop the alarm! 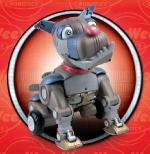 Wild eyed junkyard dog robot with several realistic behavior modes and bodily desires too. Rebellious and disobedient but loaded with personality, he scoots around on two back wheels and two front legs and generally entertains the heck out of you.